Posted December 19, 2017 by Amy Kawa & filed under Uncategorized. St. Mary’s participated in St. Luke’s Mission of Mercy Family to Family Program this Christmas season. 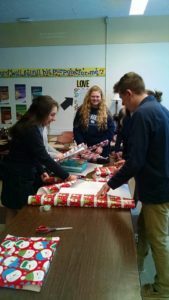 Under the leadership of the religion department, each class – freshmen, sophomores, juniors, and seniors – “adopted” a family to buy Christmas gifts for to make their Christmases a little merrier. 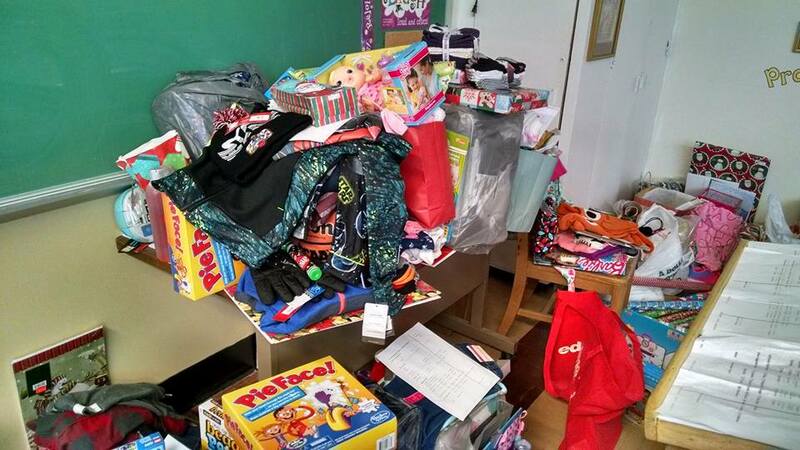 St. Mary’s students and families collected thousands of dollars’ worth of gifts throughout the month of December for 23 family members, ranging from coats and grocery store gift cards for the adults, to toys and Star Wars clothes for the children, and everything in between. After the collection of the gifts, students then wrapped each present, and Deacon Ciezki took the gifts, like Santa in his sleigh, to St. Luke’s where the gifts will then be distributed to the appropriate families to open on Christmas.